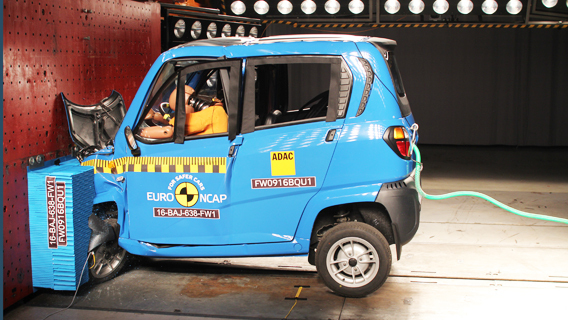 Euro NCAP developed special protocols for testing heavy quadricycles. These vehicles are not subject to the same legislation as passenger cars, and do not have to be crash tested before they can be sold for road use. Safety equipment such as a driver or passenger airbag is also sparsely fitted to these vehicles and it is expected that they would all perform very poorly when tested using Euro NCAP’s regular procedures for passenger cars. Nevertheless, heavy quadricycles are allowed on public roads where they are at risk of collision with other vehicles or obstacles. Therefore, tests are used which challenge the vehicle structure and occupant restraint systems but which offer some resolution in results to allow for meaningful comparison between vehicles in this category. 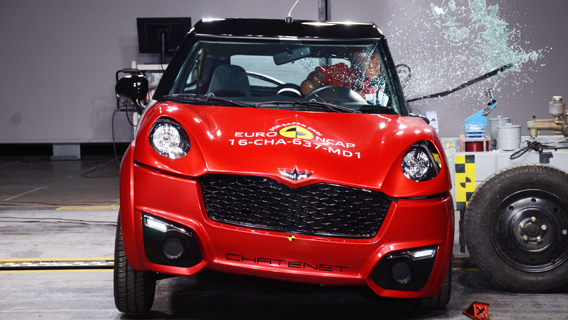 Euro NCAP currently bases the star ratings of quadricycles only on the protection they offer to adult occupants in the front seats. In the future, other components may be added to the assessment, such as child and pedestrian protection and driver assistance features. Two full-scale crash tests are done: a full-width frontal impact at 50km/h against a deformable element; and a side impact test, also at 50km/h, in which a deformable barrier is driven into the side of the vehicle. The maximum score in each test is the same (16 points). The scores are added and the percentage of the maximum is calculated. Based on this percentage, the star rating is determined.While these are severe tests for quadricycles, they are far less stringent than those for passenger cars. Quadricycle star ratings should be used only for comparison within this category of vehicles. Comparison with other star ratings is not valid. Introduced in 2014, updated in 2016.